Do you put up a tree for Christmas? I have to say, it was so nice that my husband and the kids decorated our tree while I sat back and watched. Probably the only good thing about being sick. I did have to bite my tongue more than once but when all is said and done, I this tree! I love the train, too! I always wanted one as a kid so I couldn't resist buying it. Tee hee! 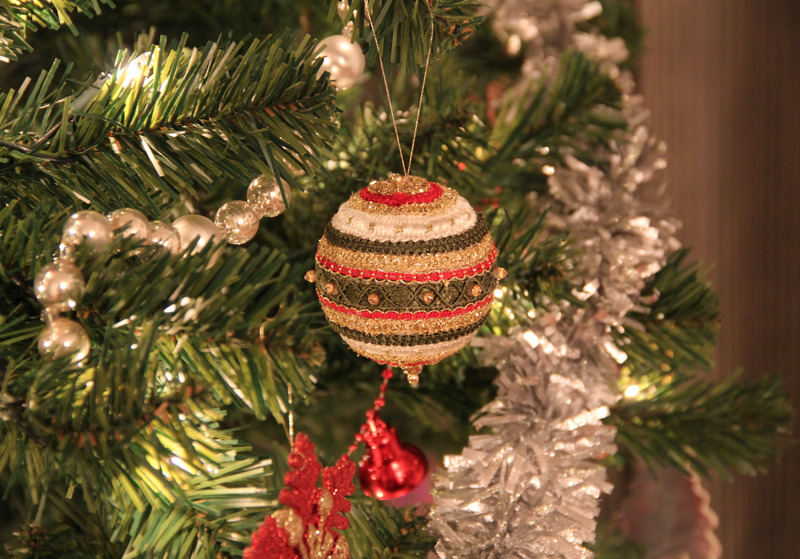 The train, I think, is my favourite part of putting up the tree. I love Christmas decorations... Very nice shots. Me, too! Putting them up... not so much. They did a beautiful job :) I really love the classic train around the bottom - very much something I also always wanted as a kid! Your tree looks beautiful! I want a train around my tree now! I know that if I did have one my 3 boys wouldn't be able to keep their hands off it! You're not far off. It was like that the first two years but now my son isn't as interested in turning it on and sounding the annoying bell. Beautiful tree! 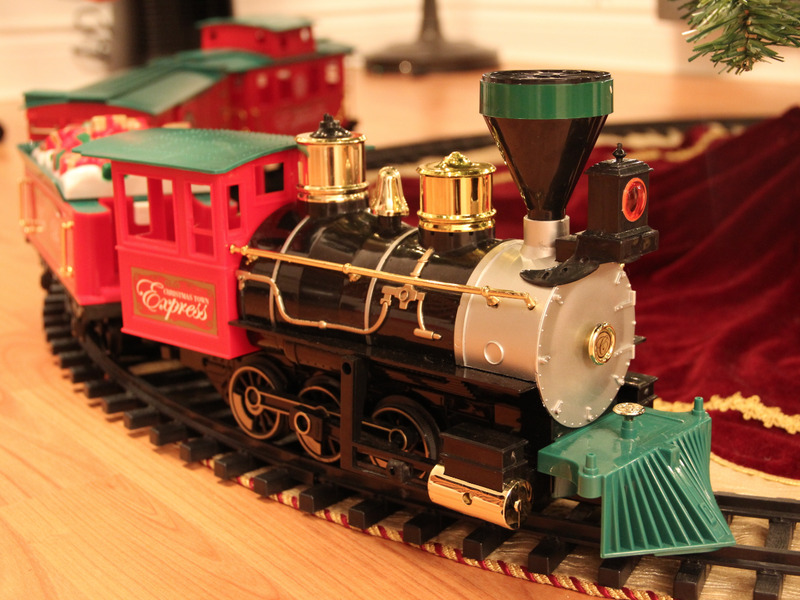 The train is the perfect finishing touch! I think so, too! Merci, Caroline! Thank you! 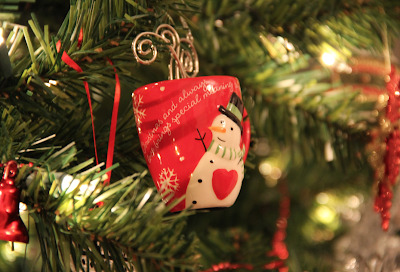 There are two matching mug ornaments. I bought them as a couple's gift for my husband back in 2009. We used to have a table top tree, too, simply because our apartment was way too small. What a beautiful tree! You husband & kids did a great job decorating! I hope you're feeling better! Happy Holidays! Thanks, Darlene! Luckily the migraine only lasted one day but I'm still fighting a chest cold. Gotta love this time of year. What a lovely tree. I especially like that snowman ornament. 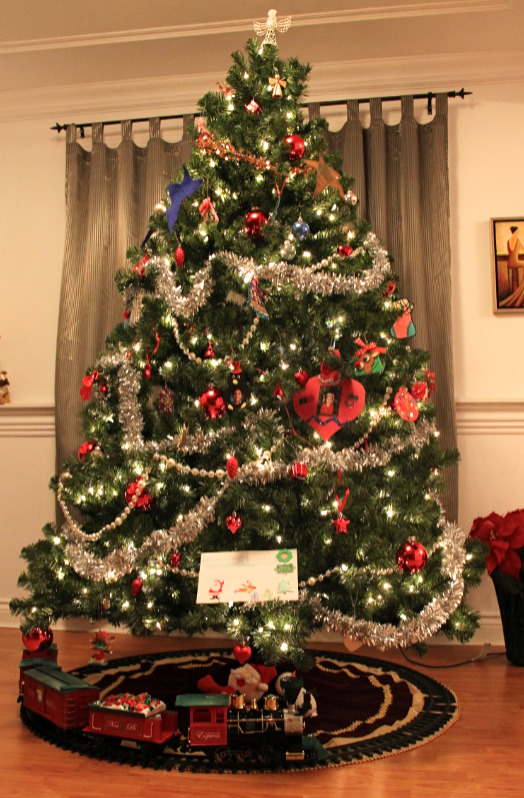 Beautiful Christmas tree Diana! I hope you are well again. Thanks for hosting. Thanks, Judy! The migraine lasted only the one day and the antibiotics helped with the throat infection. Now it's just a chest cold. Gah! I absolutely love your tree and the decorations! I love your detail shots. And I'm totally jealous of your train!! Thanks, Deborah! I found the train at Shoppers one year and used my Optimum points so I got it for next to nothing. Very lovely tree! We put ours up just earlier this week! Isn't it nice to have a tree to light up at night? What a beautiful tree! I love how it sparkles....The boys had ours up the day after Thanksgiving. Mmmm...how did you get that sparkly shot? Very curious! I'm not sure. I was logged onto Google and saw a notification that I had '3 new photos' which had been edited as .gif. So pretty! Your tree looks beautiful! I love that you put a train underneath. Nice, I like the heart shaped ornaments! Cool train! That looks so nice! 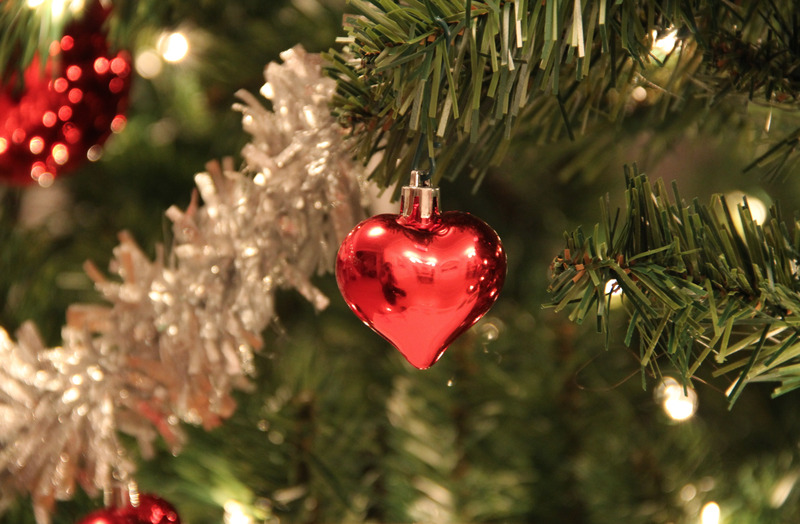 I love the heart shaped ornaments! Such a nice twist! Gord and I don't do Christmas ... we live vicariously through others. Love Love Love your tree!!!! I also like how google takes certain pictures and animate them I also have some pictures that google totally surprised me with motion and some extra added features, I think it's awesome!